Achieve the ultimate in oral health and hygiene with Sensodyne’s True White Mint Whitening Toothpaste. 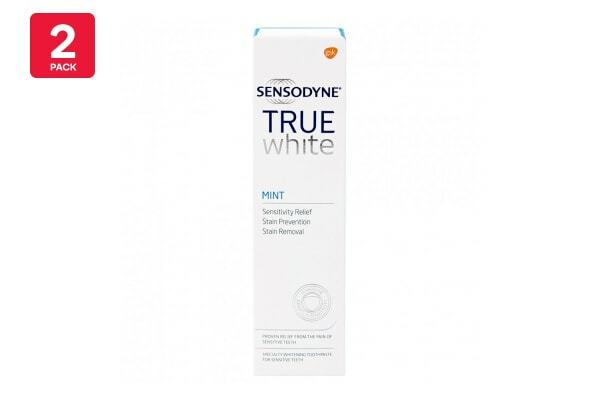 Proven to help relieve tooth sensitivity & helping you to achieve a whiter smile, Sensodyne True White Mint Whitening Toothpaste is your teeth’s choice when it comes to toothpaste. It uses an ultra low abrasive formula that will help whiten your teeth by gently lifting stains, and creates a shield to help prevent new ones from developing. With Sensodyne’s True White you can experience the benefits of both sensitivity relief and whiter teeth – try it for yourself!